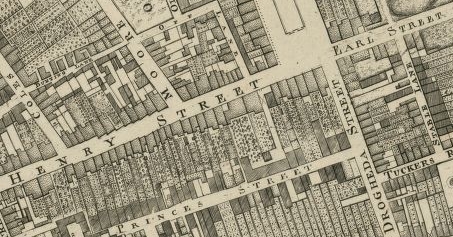 Off Lane, which appears on Rocque’s 1756 map was so named by Henry Moore, 3rd Viscount Moore, 1st Earl of Drogheda who came into possession of lands in this area around what is now the Spire on O’Connell St in 1661 following the Restoration of the Monarchy. Laying out the streets, Henry was clearly a man who wished to leave a legacy. He named some of his new streets Henry St, Moore St, Earl St (now North Earl St), Drogheda St, Mellefont Place (which was Tucker’s Row and became Cathedral St). A small lane, now called Henry Place, linking Moore St to Henry St was called Of or Off Lane. Clearly Henry had used every other combination of his titles, and was left with using the prepositions. This entire development was laid out before 1728 on what was called Ash Park by the monks of St Mary’s Abbey, where the Earl of Drogheda had taken the Abbot’s House as his city residence. After laying out his new streets, the Earl built Drogheda House, a mansion situated between Earl St and the next street north, now called Cathedral St. The Earl, clearly not wanting to waste an opportunity, called this street Mellefont Place (he was also Baron Moore of Mellefont). A fountain was situated at the front of the house, “pouring water into Drogheda St”. Drogheda St, linking Sackville St (northern end) to the river was by then only a narrow lane, and indeed on Rocque’s map, did not continue to the river. An important map in the Dublin City Library Wide Street Commission archives is shown, outlining the commission’s plans to extend and widen the thoroughfare from the end of Drogheda St through the connection with Abbey St and onto the river. Just 30 years earlier, this was a haphazard cluster of houses. Having widened the section from the river to Abbey St, and the previous widening in 1749 of what became Sackville St, Drogheda’s days were numbered, and the entire length was widened in the 1790s, becoming Sackville St (after a brief time as New Sackville St). This was achieved by Luke Gardiner, later 1st Viscount Mountjoy. The change from Drogheda to Sackville reflects also the earlier changing land ownership. Drogheda’s reign came to an end following the death of the Earl. The lands passed through the hands of Sir Humphrey Jervis, who sold them to Luke Gardiner around 1714. 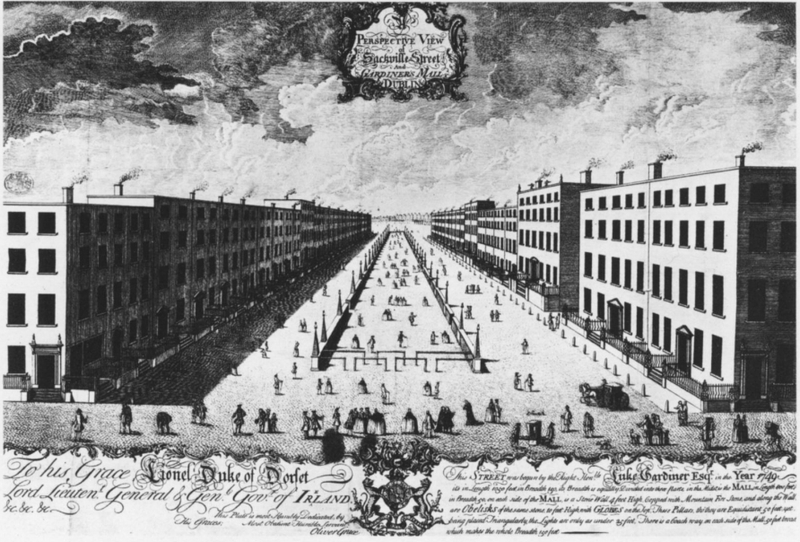 It was he who laid out Gardiner’s Mall, and the northern stretch of Sackville St; the name coming from Lionel Cranfield Sackville, 1st Duke of Dorset, who was viceroy for the periods 1731-37 and 1751-6. Gardiner also called his younger son Sackville, so we can assume the families were friendly. As mentioned we had to wait until his grandson Luke continued the street to the river later that century, and Drogheda St disappeared from the map. Sackville St eventually became O’Connell St, although not as soon as planned. Dublin Corporation, in a rash of apparent nationalism in 1884 (see John Dillon St) opted to rename the street after the Liberator, but was prevented by a court injunction taken by the street’s residents, clearly more loyal to their peers. It wasn’t until independence that O’Connell finally superseded the Viscount and the Earl that preceded him. Mrs. James F. Daly (1957) O’Connell Bridge and Its Environs, Dublin Historical Record, 14(3), 85-93. Seamus Scully (1972) Ghosts of Moore Street, Dublin Historical Record, 25(2), 54-63. Maura Shaffrey (1988) Sackville Street/O’Connell Street, Irish Arts Review, 144-149.